Boston: Dana Estes & Co., 1900. Bound in gray cloth, stamped in red, yellow and black. Front hinge just starting, but overall a tight, clean copy of this early football novel. 213 pp. Scarce in this protected condition. . First Edition. Hard Cover. Very Good/No Jacket. NY: Cupples & Leon Company, 1934. Bound in red clothe, stamped in black. A tight, clean copy of this rather massive book of three football stories. Over 600 pp. Scarce in this condition. . Reprint. Hard Cover. Very Good +/No Jacket. New York: Grosset & Dunlap, 1923. Bound in gray, decorated cloth,in illustrated dust jacket. 348pp. Book is tight and clean, dust jacket shows some edgewear. . Fifth Printing. Hard Cover. Very Good ++/Very Good Only. NY: D. Appleton and Co., 1930. Bound in purple cloth, stamped in orange. Lacks the dust jacket. The second printing (has the (2) on the last page, but in the same format as the first edition. Spine is faded, but still readable. 276 pp. . Second Edition. Hard Cover. Very Good +/No Jacket. Boston: Little Brown, 1936. Bound in blue cloth, stamped in orange. The first edition of this rather scarce book in the scarce dust jacket (unfortunately the jacket is attached to the book at the endsheets. The front free endpaper is missing -- but still a scarce book with the dust jacket. 220 pp. . First Edition. Hard Cover. Good +/Good. Boston: Little Brown, 1914. Bound in green illustrated cloth with a picture of a running back on the front panel. An early edition, published two years after the first. 321 pp. + ads. Top edge gilt. . Early Edition. Hard Cover. Very Good +/No Jacket. NY: D. Appleton and Co., 1917. Bound in red cloth, stamped in gold with color illustration inset of two players on the front panel. A tight, clean copy of this book. Scarce -- only six (6) copies on OCLC/Worldcat. Four color illustrations. 271 pp. The true first with a (1) at the bottom of the back page. . First Edition. Hard Cover. Very Good +/No Jacket. Phila: David McKay, 1911. Bound in maroon cloth, stamped in orange, black and white with an illustration of a kicker on the front panel. Scarce title in this series. Book shows some scuffing, primarily to spine ends and a weak front hinge, but still acceptable. 336 pp.. First Edition. Hard Cover. Very Good/No Jacket. New York: Cupples & Leon Company, 1911. Bound in illustrated dark gray cloth with an illustration of a running back on the front panel. "A story of college football"; Illus. ; 307pp. + ads. Presentable copy in the original dust jacket. . First Edition. Hard Cover. Very Good ++/Very Good +. NY: D. Appleton and Co., 1912. Bound in blue cloth, stamped in red and white with color illustration of a punter on the front panel. A beautiful, tight, clean copy of this book (looks like it was printed last week and not over 100 years ago). Four color illustrations. . First Edition. Hard Cover. Near Fine/No Jacket. NY: Grosset & Dunlap, 1928. Bound in red cloth, stamped in black, in matching illustrated dust jacket. This may have been a review copy because it has "Office File Cope" across the top page edges. 323 pp. + ads.. First Edition Thus. Hard Cover. Very Good ++/Good +. NY: D. Appleton and Co., 1915. Bound in Navy blue cloth, stamped in gold (which is still bright). Illustrated front panel by Leyendecker. This book contains the four color illustrations by Norman Rockwell. The true first edition with the "1" at the end of the text block on the last page. Tight, clean copy -- but there is a bit of mottling the rear panel shows one drip mark. Previous owner's neat inscription to ffep. Priced accordingly. 299 pp. . First Edition. Hard Cover. Very Good +/No Jacket. Illus. by Norman Rockwell; Frank Leyendecker. Chicago: Triumph Books, 2006. Bound in Eagles green and white with white stamping in illustrated dust jacket with McNab on the front panel. A 187 pp. 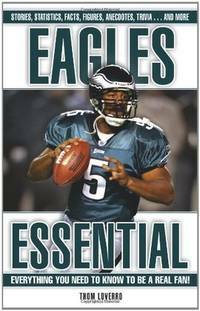 book on the history of the Philadelphia Eagles. . First Edition. Hard Cover. Near Fine/Near Fine. Upper Saddle, NJ, U.S.A.: Prentice-Hall, 1977. A light bit of scuffint to top of spine at dustwrapper. Overall, a tight, bright first edition of this biography of the Philadelphia Eagle and the last player to play both ways. Called a "sixty-minute man". Inscribed and Signed to Andrew and Wes on the front free endpaper. Scarce signed book. 210 pp.. Inscribed and Signed By Author. Second Edition. Hard Cover. Very Good ++/Very Good +. NY: Grosset & Dunlap, 1931. Bound in red cloth stamped in yellow and black. Rather scarce title. Illustrated -- 247 pp. Tight, clean copy. Scarce in this condition. Previous owner's name, address to front free endpaper. . Early Edition. Hard Cover. Very Good ++/No Jacket. Illus. by W. B. Grubb. NY: Hurst and Co., 1911. Bound in tan cloth, stamped in red, black and white with illustration on front panel. A tight, clean copy of this early football novel. 316 pp. Four Illustrations.. First Edition. Hard Cover. Very Good ++/No Jacket. Illus. by Theo Bectholf. PA: Penn Publishing, 1910. Bound in brown cloth illustrated front panel of a football running play. An early reprint in great condition. Scarce book -- especially in this protected condition. 333 pp. Illustrated endsheets. . Early Reprint. Hard Cover. Very Good ++/No Jacket.